“Marital Advice to my Grandson, Joel” is a humorous, laugh out loud series of tips on marital advice from Peter Davidson, who is a blogger and has survived years of marriage with his wife. As a wife of 41 years, I can say I laughed so hard throughout the book I cried. Starting with the engagement of his grandson, Davidson jumps head first into saying, “It’s like giving you a rowboat somewhere off the coast of California, and pointing out into the ocean and saying, ‘If you paddle in that direction you’ll eventually reach Hawaii.’” In other words, conditions are unknown. His comment about not getting married on Saturday or Sunday due to sporting events and the groom’s role in planning the wedding hits right at home for many. The section on Eating Etiquette and advice on what color shirt to wear depending on what you are eating and will invariably spill on your shirt reminds me so much of my husband. Regardless of how careful he is, things just magically appear on his shirt. Another chapter full of wise wisdom is the one on, “Her Silent, But Very Loud, Language.” How many of us have used these silent but powerful signs when our husband or partner didn’t please us? I can personally attest to silence, and my husband knows to go in another room to avoid trying to figure out what he did. The book is small, easy to read, full of humor and it seems like the author is sitting in the same room with you. He presents his advice in a very personal approach, and you can’t help but follow some of these tips. I thought the cover fit this book perfectly and the writing is just “down home conversations” with each of us. 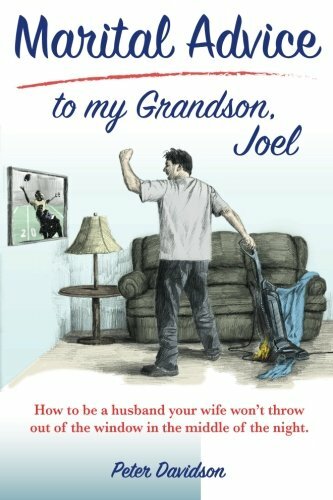 If you want some deep belly laughs along with some great insight into the world of marriage I recommend this entertaining read by Peter Davidson, “Marital Advice to my Grandson, Joel”.